two-room apartment at the first floor, with 11 steps, with 1 bed room plus 2 single beds in the living room.The apartment is not smoking, but is possible to smoke in court-yard. Nearby are restorants, cafè, pizzeria Vesuvio , the best pizza in Venice, pharmacy, bakery, taxi water to the city and to the airport. The railways station Santa Lucia is at 10 minutes by walk. The Jewish area is very interesting place. Maria Teresa is a wonderful host who provided us with treasured memories of Venice. She was responsive and helpful with all our inquiries. The location is near the vaporetto (1 stop from Marco Polo airport) and within easy access of all the sites - Rialto Bridge, San Marco etc. Yet it's far enough away from the heavily touristy areas to give you a flavour of the real Venice. The place was spotless and she welcomed us with a bottle of lovely wine. The WiFi was great - always important! We suggest a place called Vino Vero for wine and Cicceti (tapas), which is very close by. I would definitely book this place again. The apartment was very clean. The furniture was very nice. She left us bread, butter, jam and fruit. Showed us around the neighborhood. The market was a show stopper. Loved everything. Thank you Nancy for your positive response!! This lovely small apartment was ideal for sightseeing and living like a local. The airconditioning was excellent in the living room and kitchen area, but there was only a fan in the bedroom. When you open the shutters and see the canal through the window, you gasp at the beauty. Excellent restaurants and stores within a few minutes walk. The correspondence with the owner via email was EXCELLENT. She even arranged to leave us bread, butter, honey, jam, and coffee for our first few breakfasts! We were pleasantly surprised on the greatness of this place. Beautiful, spacious, natural light, comfortable, and great bathroom. Beds are hit or miss, it was comfortable for me and too hard for my husband. Host had comfy and safe crib for our 11 mo. infant. 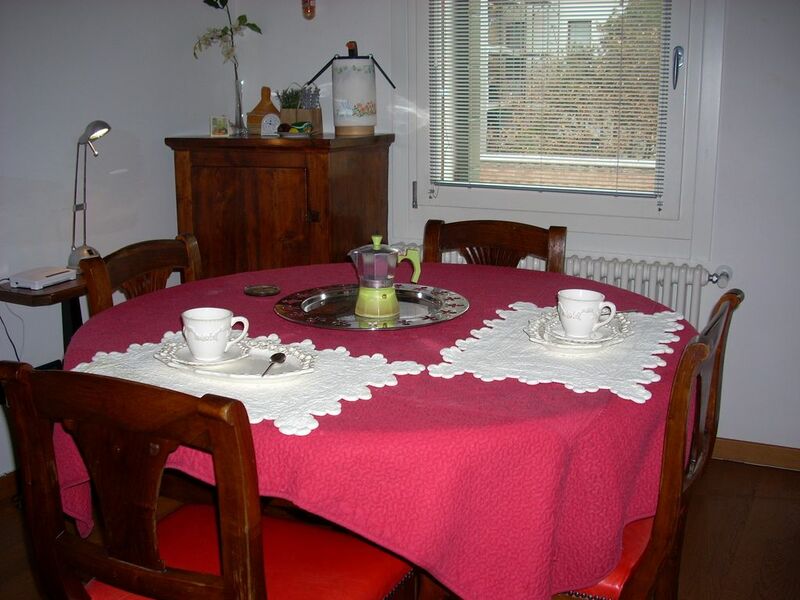 Location is great near bars and restaurants and vaporetto and aliguna to the airport. Comfortable. Homely. Everything is within easy walking distance. Perfect. Owner clearly communicated. Everything went smoothly. A home away while exploring Venezia. Miglia Gracie ! Great Place, not managed well. We loved the place. The kitchen was well equipt and I was able to cook friends a lovely dinner. The view was great, a canal right outside. Our issues were that we had trouble in that the number they provided to get in touch and tell them our later arrival time didn't work and they didn't get the text. So when we arrived at the station we called a few different versions of the number, 2 numbers in the beginning removed, and it worked and when we did get in touch I got quite scolded by her helper, and more than a couple times we were spoken to about it distastefully. It colored the first evening of our trip, feeling like we had done something wrong. When she walked us to the apt, things were still drying waiting to be put away, as if our lack of calling caused them not to take our reservation and full down payment seriously. Her helpers attitude dismayed our experience. Also, there was no bathroom soap at all, and we kept forgetting to pick some up while we were out touring Venice, so we spent the four days showering with no soap or shampoo, which wasn't very nice. I wish they would have had some soap available. ....with 2 phon number you thought you did not comunicare to anyone, your arrival in Venice??! !veryclever compliments!! !have you ever read my email from23 September until 22 October where I asked for info on your arrival!! You left the mine apartment with rubbish full , with empty wine bottles 7 , indecent bathroom towels, you cleaned your shoes and other too!!! You have been very, very rude!!! The soap box was full, but used on shower!! The check-in was at 14.00 until 15.00 to apartment , but nobody arrival and no news, from you,at the end your arrival was at 6.40 pm at Santa Lucia Station , you called my helper just when you are into statio! !